A former high school Economics teacher and education policymaker from Singapore, Jolyn Chua recently completed her Masters in Education (Mind, Brain and Education) at the Harvard Graduate School of Education. She has been attending Out of Eden Learn team meetings. Behind every piece of student work is the ever-changing story of a child’s personality, intellectual interests, strengths and struggles. What inspires this child to wonder? What does the child care about? What was the child working on, or trying to understand when working on this? Inspired by the class we took recently with long-time Project Zero researcher Tina Blythe, my friend and fellow HGSE student Anjali Rodrigues and I led an hour-long Google+ Hangout to look at a piece of student work from Out of Eden Learn (OOEL). The recording of the session can be viewed here via OOEL’s Youtube channel. Joining us were OOEL educators Anna Moutafidou, Natalie Belli and Rob Martin, who teach in Greece, the U.S. and India respectively. Liz Dawes Duraisingh, Carrie James and Sarah Sheya from the OOEL research team also participated. We chose to look at the work of destructionking, one of Rob’s students and selected this photograph, from Footstep 3 of Learning Journey 1: Taking Neighborhood Walks. Using the Collaborative Assessment Conference, a discussion protocol designed by Steve Seidel and Project Zero colleagues, we came together to look slowly at this intriguing piece of student work. We learned to pay attention, to suspend judgment and to resist the urge to immediately critique the work. We wanted to know more about the student’s motivations, prior experiences, aesthetic sense and intellectual interests. Why did the student take this photograph? What does the student know about the water supply system in the city? Is this an issue that affects the student personally? Does the student think that the truck is beautiful? Was the student trying to figure out what works in the city, and what could be improved? Was the student thinking of teaching others about everyday life in India? We wanted to know more about the student’s living environment and classmates. How regularly does the water truck come by? 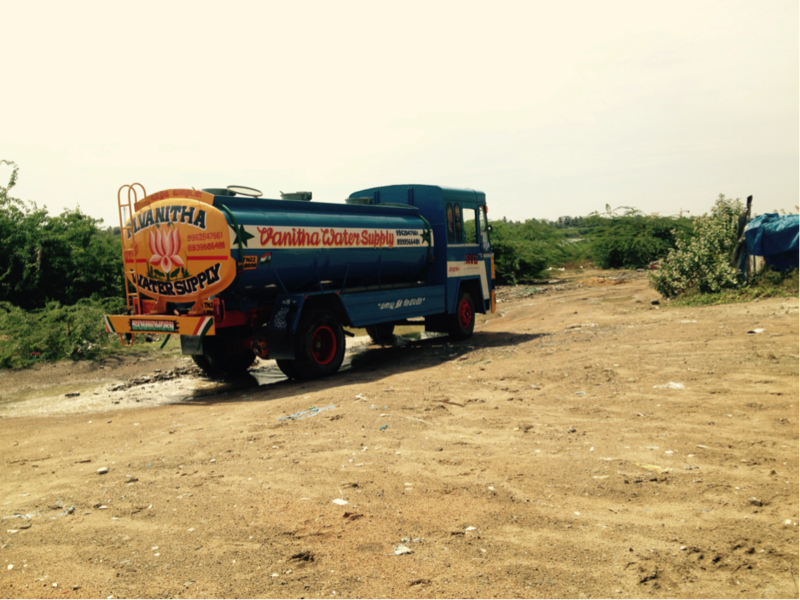 Do people in Chennai notice the water leaks from such trucks, and do they run out with buckets to collect the water? What do the students’ classmates think about this photograph? Do they experience similar issues? Our discussion on the implications for teaching and learning flowed organically at Step 6. What’s next? If we asked students to build on their work from this footstep, it would be interesting to see what they would choose to focus on. Should the OOEL curriculum develop student interest in the way their neighborhood is, what it should be and what students can do to help? How important are comments and feedback to learning? It seems that having an authentic audience is an important part of the OOEL experience. I was struck by the parallels between what we encourage our students to practice and hone on OOEL, with what we experienced as a group of educators through this session of close looking. One of OOEL’s learning goals is for students to ‘slow down to observe the world carefully and to listen attentively to others’. Tools such as the Dialogue Toolkit help, as Carrie James noted, by providing a set of moves, strategies and routines to promote rich online dialogue. Similarly, our group used the CAC as a discussion protocol to slow down and look closely at student work to uncover its complexity (see Shari Tishman’s blogpost on this topic); to listen carefully to each other’s observations and questions; and to foster our curiosity to learn more about our students, and places which may not be familiar to us. This session demonstrated the power of educators generating ideas from a shared experience of looking and describing student work. It is one of the important ways in which we can continue to build an OOEL educator community. It was a deeply engaging, thoughtful, humbling and uplifting session for me. Look out for similar Hangouts in the fall.